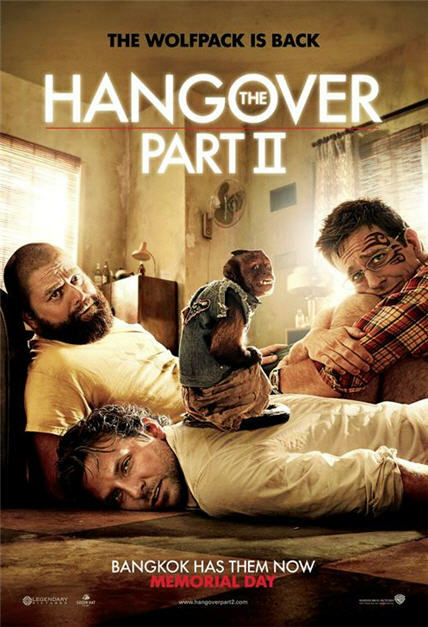 Since the sequel has just been released, it reminded me of my feelings about one of the most overrated films in recent years – The Hangover. Everyone knows the premise. After arriving in Vegas for a bachelor party three guys wake up the next morning with no recollection of the wild night that happened before. They’ve lost the groom, there’s an lying amongst an outlandish aftermath and they have to piece together what took place. It’s a great setup for a comedy, unfortunately the humor that seemed to capture the hearts of moviegoers escaped me. I kept waiting for the funny bits to start, but they never did. The guys find a baby. They find a tiger. They meet a stripper. Meet some gangsters. Meet Mike Tyson. And constantly yell “what happened last night???”. And it all amounted to a pretty boring movie for me. Now there’s a sequel. It seemed like a given. A movie generates the amount of money the first did everyone wants to repeat its success, even though it’s a real stretch and the premise for the first film seemed like a one shot idea, that’s didn’t stop them with going ahead with a Part 2. Admittedly I haven’t seen (or plan to see) the sequel. Maybe it’s funnier than the original, but it sounds like it’s just a retread of a film where the humor that made it so popular I completely missed. But maybe that’s enough for everyone else to make the Hangover Part II another success.